October is traditionally our busiest month, where we give you all sorts of treats for your Halloween pleasure. We have a whole lot of info on a whole lot of games today. We have been powering through production and flavortext creation for the Apocrypha base set. 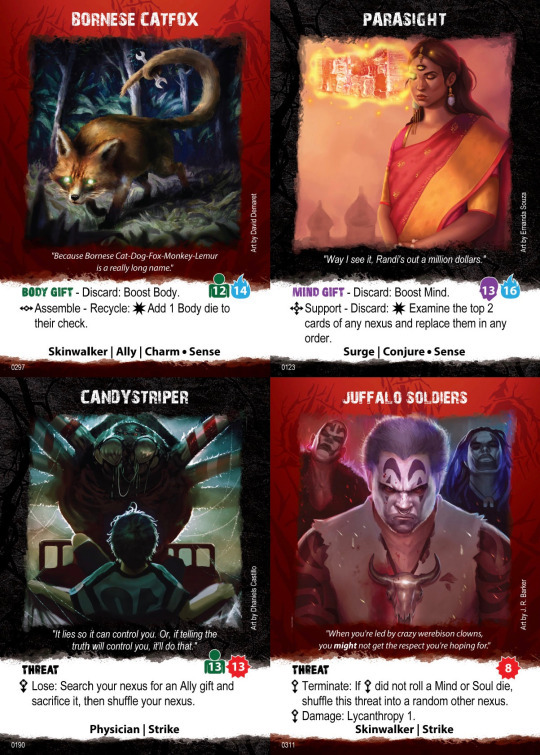 Elisa has been cranking out card layouts, and this approach is where we’ve ended up. The game is looking really good and playing really good. We’re excited to be in the final stretch on the base set. Speaking of spooky things, we have three offerings this month that we think you’ll love. 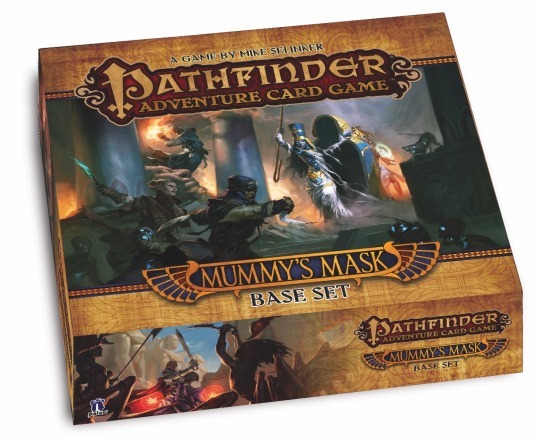 The Pathfinder Adventure Card Game’s new base set Mummy’s Mask is shipping to Paizo subscribers now. This is our coolest, craziest set yet. It takes place in the tombs of an Egyptian-inspired city and ends in a flying pyramid. If you’ve been saying “It’s been a long time since a PACG set came out,” you can see why here. We took our time to make a fantastic game. The Base Set and Character Add-On Deck are available now. We also are releasing our 20th (!) class deck for the game, with Gunslinger, Warpriest, and Summoner Class Decks, also available now. You can see a lot more about Mummy’s Mask in the Mummy’s Mask preview on the Paizo site. 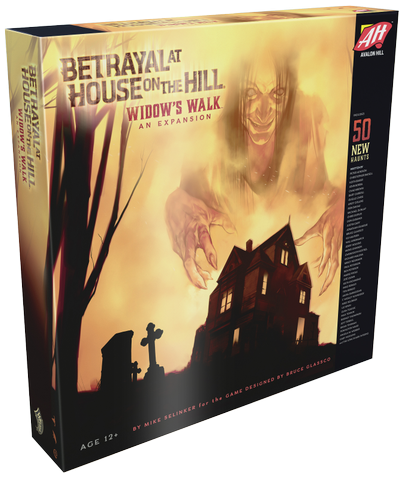 After 12 years, Betrayal at House on the Hill’s first expansion is finally coming out. Widow’s Walk is a new expansion jointly released by us and Wizards of the Coast’s Avalon Hill team. It’s got 50 new haunts, 30 new cards, 20 new rooms (including a new floor! ), and fistfuls of new tokens. We brought our whole crew of Betrayal-loving friends, like Adventure Time creator Pendleton Ward, Borderlands writer Mikey Neumann, and Doubleclicks singer Angela Webber, among dozens of other surprise guests. It’s really nice to go back to the house again. You can read more about the new Betrayal set on the Widow’s Talk blogs on the Avalon Hill Facebook page. And here’s a final horror-themed game of a very different stripe. 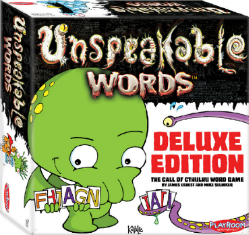 After a couple years out of print, our insanity-producing word game Unspeakable Words has finally returned with an all new look. The Deluxe edition is illustrated by our friend John Kovalic in a delightful Lovecraftian style, filled with somber and disturbing … no, just kidding, it’s adorable. You can also get the original version illustrated by Tony Steele too. Both of these are shipping from Playroom to Kickstarter backers and will be available for purchase to the general public Real Soon Now™. Those are some great games for your Halloween party. Thanks for supporting Lone Shark, and if you want to be in that Thornwatch Kickstarter, jump on it right now!